Staff photo by Emmy Errante. Tony Jacobs and Anita Dingler curl at the Wilmington Ice House Friday, Dec. 5. The game of sliding heavy stones across a frozen pond emerged during the 16th century in Scotland. In 1998, the sport known as curling gained worldwide attention in the Winter Olympics, piquing the curiosity of billions. 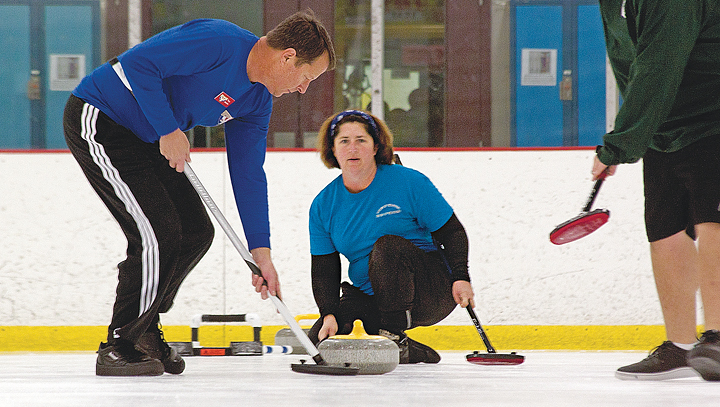 The popularity of the game spread from the frigid North to the temperate state of North Carolina, where, in 2011, a small group of curling enthusiasts formed the Coastal Carolina Curling Club. Saturday, Dec. 13, the club invites others to discover the sport for themselves during a Learn to Curl workshop at the Wilmington Ice House. The event begins at 5 p.m. with an overview of curling rules followed by practice of curling technique on the ice. The workshop is $20 and all equipment is provided. Club president Roger White said the first step to playing a curling match is preparing the ice. He said he douses the ice with a fine spray of water from something similar to a pesticide pump nozzle to create tiny frozen droplets. Participants will then split into teams of four. Each team member gets two turns to slide a 40-pound granite stone toward the opposite side of the rink, with the goal of placing it closest to the center of the circular target, called the house. The World Curling Federation describes the game as one of the oldest team sports in the world because each team member actually plays a role in every shot. After the thrower releases the stone, two team members run beside the stone, sweeping ice pebbles in the stone’s path with specialized brooms to enable it to travel faster. The fourth teammate stands waiting in the house, providing instructions to the thrower and sweepers about the weight, speed and curl of the throw. Club member Tony Jacobs agreed, calling it “chess on ice” because of the importance of devising, communicating and executing a strategy. The game is also physically demanding, he added. “I’ve come off the ice soaked, dripping wet,” Jacobs said. Despite the exertion sometimes required, White said one of his favorite aspects of curling is everyone, regardless of age and natural athletic ability, can learn to do it.